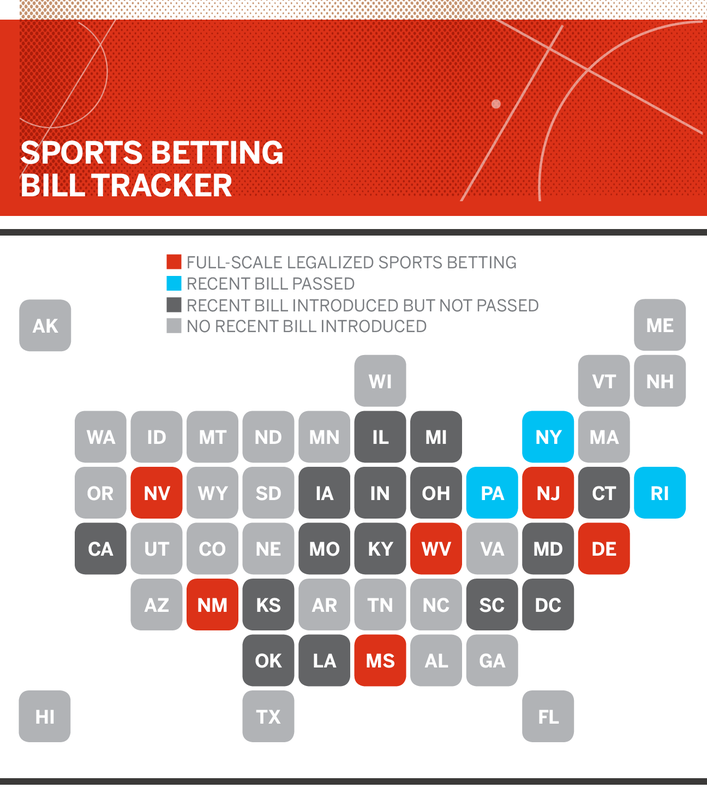 After New Jersey's Supreme Court victory, any state that wishes can legalize sports betting. At the same time various state lawmakers are considering sports betting legislation, Congress is too. Senators Chuck Schumer, D-N.Y., and Orrin Hatch, R-Utah, have both made official statements in support of new laws to address sports betting. On Sept. 27, the House Judiciary Committee held a formal hearing on the topic. Last updated on Oct. 23, 2018. On June 22, 2018, Gov. Gina Raimondo signed the state budget, which included language allowing sports betting. Only two locations -- one in Lincoln and one in Tiverton -- would be allowed to offer sports betting. The state's lottery would oversee the process. Only bets placed in-person would be allowed at the two locations, as the new law does not provide for mobile betting. In 2013, New York passed a law to allow sports betting at four on-site locations. After lying dormant, the law could be revived. The New York State Gaming Commission is aiming to complete regulations "in the short term" for the four locations specified in the 2013 law. Legislation that would have allowed for full-scale sports betting in New York failed in June 2018, but could be re-introduced in 2019. New York's long-running issue with fantasy sports perked up in late 2018 too. On October 26, Acting Supreme Court Justice Gerald W. Connolly ruled that the state's two-year-old DFS law violated the state's constitution. "The judge's decision was unequivocal," said Cornelius D. Murray, the lead attorney representing the plaintiffs in the case, in a statement to ESPN. "The ruling found that New York's DFS law was unconstitutional beyond a reasonable doubt." In the wake of the ruling -- which will likely be appealed by the state Attorney General -- both DraftKings and FanDuel confirmed that they will continue offering fantasy contests in the state. On September 18, 2018, Councilmember Jack Evans formally introduced "The Sports Wagering Lottery Amendment Act of 2018." The purpose of the proposed legislation is to "legalize sports betting in the District of Columbia, while also creating strong regulatory structures that ensure consumer confidence." The bill would allow both online and in-person wagering, with the District Lottery in charge of regulatory oversight.